NLTS can be a little tricky at first if you have never used it before,Kracka and schiedes witnessed my first attempt with it. But after some practice, its a very fun mod. You keep the throttle at 100% when shifting and just push the clutch in quick, it really does make a world of difference. Hmm. It must do ECU-based rev matching, then. It detects the pedal floored and when you touch the clutch it drops the revs enough to match up with the next gear. It drops the RPM's by a user-set amount. I personally have mine set at 1000. Clutch in at 7500, RPM's drop to 6500; clutch in at 4000, drop to 3000, etc. Is that usually the standard amount 1000? Thats what mine was too. I believe 800 is the default, but I generally set it to 1,000 on any car I install Tephra on. It really doesn't matter much since the actual RPM drop is ~1,500 (varies depending on gear of course); you'll only notice if you're a slow shifter. The only time I actually bounce off the limiter is doing a NLTS into 5th gear; I baby 5th so I don't get the common grind so so many people have developed. Well my car goes through 1-4 gears beautifully. However, last night doing a fifth gear pull (freeway passing)the clutch basically opened up completely, meaning slipped horribly. It slipped and bounced all the way off the rev limiter. I let it cool down and its back to normal but the new clutch will coming soon now. I was thinking about doing a few things before it because it was holding up great. However I don't want to have to think about it anymore. So new clutch will be coming. Haha I knew it wouldn't last very long. NOw it's getting not fun to drive...going to order my ACT 6 puck very soon I am thinking. Maybe today. wut? passing on the freeway w/o downshifting? zzomg! No need to now, well there wasn't. Enough power in fifth to pass. When you are going 80 already, the gearing on the X is such that you are already building boost. So fifth gets used a lot for passing, at least for me. Passing? I'm always in the right lane. I hate 5th gear...at 45ish it is at a lugging rpm range. Haha with my DSM I never downshifted from 5th to pass. 16g FTW! evox gearing ftw i guess since you are always above 3krpm. Get the Shep final drive. Id rather invest more in my head or even drop ins, rods/pistons, and rev the car out to 8500-9000rpms. Then get taller tires if need be. That way I wouldn't need this. I plan to Shep my drive train if/when I manage to toast the six puck. New ACT clutch/flywheel are in at DB (at least I am pretty sure they are, Shane said yesterday or today). I ordered some new Mits spark plugs, mine looked pretty old when Shane checked them. I also just ordered the DOM2 wga, its a 20psi one. It seems to hold boost way better, so maybe I can erk out some more power. Here is a red before and after boost plot using the dom2 actuator. Very similar to mine, tapers to 26psi ish. 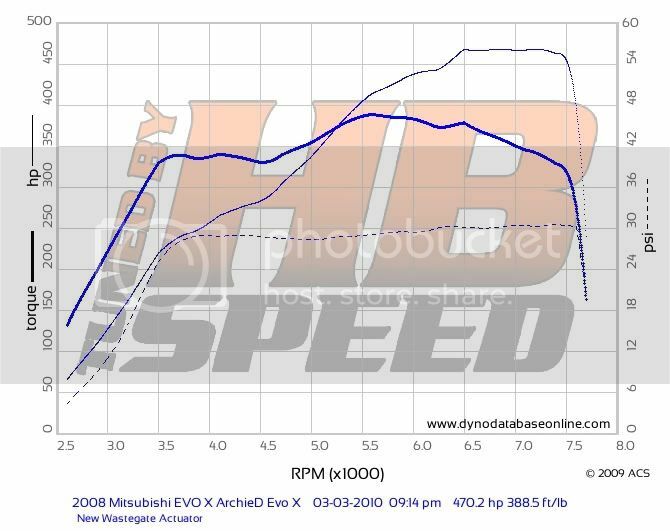 If you look at the new graph, you can see he hits peak power at lot sooner and it won't go up because he has exhaust restriction, he is still on a stock unmodified manifold and 2.75" exhaust. So if he opened that up he would've made quite a bit more power.